Pretty easy introduction. What the hell was I thinking? I had no idea. I decided to create SIM skins for that popular PC game, the SIMS. I had the sudden urge, like any creative person, to create my own SIMS. I downloaded SimShow back when I first bought the game, and on a whim I installed it. I discovered that although I do not have a huge talent for it, I do end up with some pretty unique Sims. First I was limiting my skills to Anime styled sims, but I also was able to do friends of mine. Either way, this will be my tiny contribution to the internet. I'll put my incarnation of the sim along with a photo of either the person I had done or the character I was trying to do. Sometimes I just did outfits instead of full head and body combinations. This page is pretty image intensive, so please, allow all the images to load to get a good idea as to what they look like. You know the drill. For The Sims 1, Click on the Sim you want to d/l. It'll prompt you to d/l a zip file. Pretty easy stuff. Unzip into your X:\Program Files\Maxis\The Sims\GameData\Skins\ directory. Some skins have been known to crash games. My skins do not do that to my game, but it may vary from game to game. I'd check with Maxis with it. These were created using the Maxis The Sims add on program "Sim Show" and Adobe Photoshop. I'm REALLY just learning, and I someday will figure out how to really do this. For the most part, they look alright, but will be adjusted later on in life. Enjoy. Finally I've gotten around to updating this page to reflect all the new work I've done. I do intend to move some of the better older skins into the new game, but the inspiration demon got a hold of me and I had decided to do the "X-Men Evolution" cast. 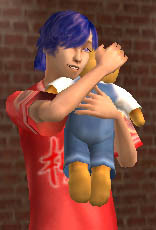 I have uploaded them over to my Sims 2 page on their main website. Please check them out! I have pictures under the sections here, but for the time being I'm throwing them to their server because of these guys are large in size. 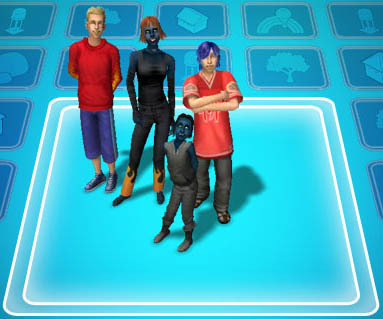 Here we have Mystique and Nightcrawler along with my Nuriko sim and a random parent to the Nuriko sim. 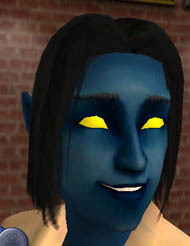 Blue skin and yellow eyes. Huzzah! Email me if you have any questions, or something. Hello! Welcome to my Sims Skin page. On the bottom there are two menus. One are links to my original "The Sims" skins which are hosted here. On the right are links to what I've done for "The Sims 2" which will contain links to where to download those from my personal page off the Maxis site. The Sims and The Sims 2 are copyright Electronic Arts, Maxis, Etc, Etc. This is just a humble webpage of skins that I have created. 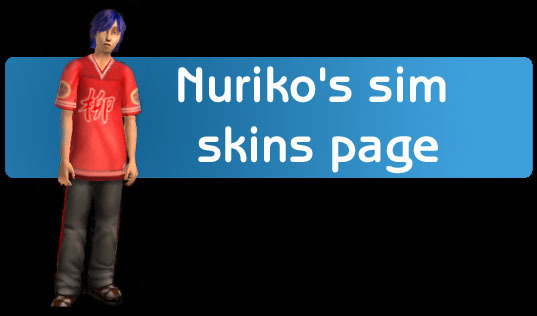 There are people out there bored enough to check out Nuriko's Sims.